11 Miles to Paradise Trail Run featured record breaking performances for both men and women. The course starts with a fast downhill mile on a logging road before switching to twisty singletrack. It's a runners course, but there are plenty of tricky spots that treat athletes to bumps and bruises from falls over rocks and roots. This year's field was by far the most competitive in the event's five year history with 5 women breaking 1:21, and 6 men under 1:08! For comparison, last year was the second most competitive year of the race but only had one runner under 1:06. This year 4 runners eclipsed that mark. Although pre-race contenders Jim Rucker and Jeremy Wolf didn't start, they were replaced by a couple of UM Grizzly distance runners making their trail racing debuts. The young speed ensured a fast opening pace with no fewer than 7 men in the lead pack opening the first mile in sub-5:20. Once on the single track, UM's Adam Wollant set the pace. I kept close and made a pass by mile 3 only the lose the front-runner position to Wollant by mile 5. We kept that order until the end. My excuse of tired legs from last week's DFMI 30K was not too convincing, since Wollant--a junior at UM originally from Bozeman--just finished a very respectable 7th in the 10,000 meters at the Big Sky Conference Championships on Friday! His run not only earned him victory, but a new course record that bettered my 2013 mark by a nearly 20 seconds. Not bad for less than 48 hours rest. I came in 18 seconds back, which was good enough to come in under the old course record as well, while Polson's Jason Delaney finished third in his return to racing after a springtime hiatus from running. Nicole Hunt knocked a full 45 seconds off of her 2014 time and seemed in high spirits at the end after keeping up the pattern of lowering her previous times every year. Elizabeth Paddock, a former Missoula Marathon champ who competed at Cornell in college, improved to 2nd place this year from her 3rd place finish a year ago. But it wasn't easy, only 1 second separated her from Marie Ferda of Kalispell, a 2-time NCAA Division III champion in the mile and in cross country while at Bethel College. 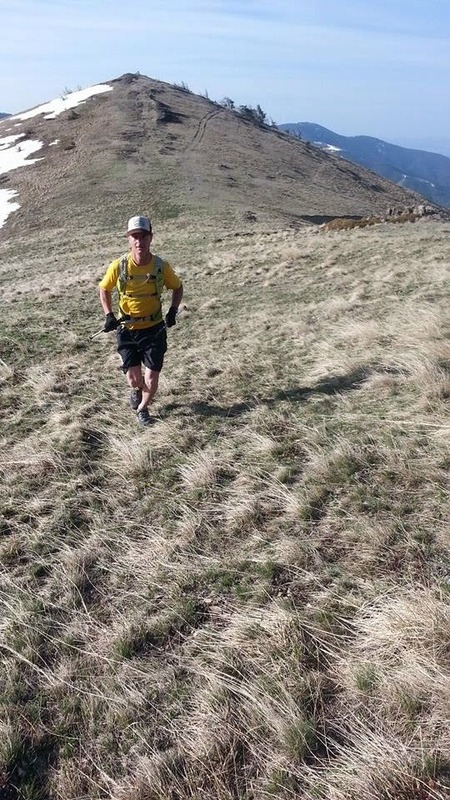 Sun Mountain 50: Congratulations to Missoula's Babak Rastgoufard for taking 3rd at the Sun Mountain 50, a race put on by Rainshadow Running and taking place in Washington Methow Valley. Missoula's Patrick Murphy finished 5th in the accompanying 50K. Nice work guys! Mountain Monday: Group run up Sentinel today. All are welcome. And as usual we're meeting at noon at the Clark Fork River trout statues at Caras Park beneath Higgins Ave Bridge. As a bonus we'll run by the brand new MTC Stone that is given to recognize supporters of the "M" Trail. Passing by the stone you'll see that there are plenty of runners and running organizations who support the "M" Trail. We're proud to be among them. Update from Kameron Kidrick and MTC's Prairie Faction: Trail runners from North Central Montana, locally referring to each other as “The Prairie Faction” of Montana Trail Crew, are in full swing as the weather is changing. Centered in Great Falls and the surrounding communities, runners are hitting the trails in force. The trails along the river are running nice when dry, which has been mostly from February until this weekend. The Highwood’s are generally free from snow and as of Sunday, the mountains are a bloom. We received a blessing with some much-needed snow in the high-country but most of this should be gone by next weekend. The river bottoms on the East side of the Bob along with the gulches along the Front are getting greener and greater each day. The Little Belts still have snow up high but most of the lower trails are dry including the popular Sluice Boxes. Local runners are putting in their time preparing for local and regional races including Bighorn, Old Gabe, Elkhorn, and Leadville among others. Look forward to seeing some of you there or out and about in some of the amazing country east of the Continental Divide. Trail Work Day: Thanks to all of the volunteers who made it out for MTC's first trail work day of the season. We got a lot done, including weed pulling, barbed-wire removing, rock hauling, and trail tread laying. Anyone who visits our adopted trail will notice the immediate improvements this effort made. We're hoping to do a couple more trail work days in the not-so-distant future, so sign up for our email newsletter for updates. Rattlesnake sighting: Morgan Valliant, Missoula's conservation lands manager, reports that there has been a confirmed sighting of a rattlesnake on Mount Jumbo. This area see a lot of runner traffic, so stay safe out there and keep your eyes out for snakes while running these trails. Rattlesnakes add to an impressive list of species that utilize the mountain. Besides a resident elk herd, Jumbo also sees activity from mountain lions, bears, deer, moose, and even big horn sheep.